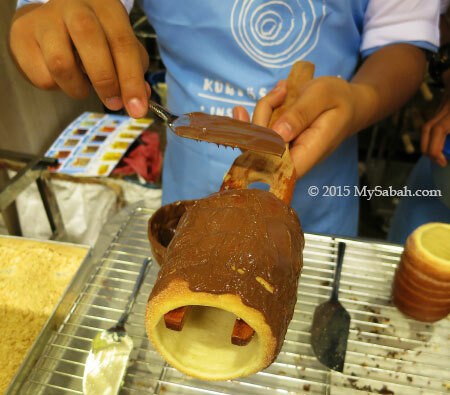 Kürtös Spiroll™ brings a 300-year history pastry, Kürtös Kalács, from where Dracula lived* to Sabah. It is the oldest Hungarian pastry which stems from the Hungarian words kürtő that refers to “chimney” and kalács meaning “cake”. Kürtös Kalács is still a popular delicacy today especially in Eastern Europe during special occasions such as wedding. 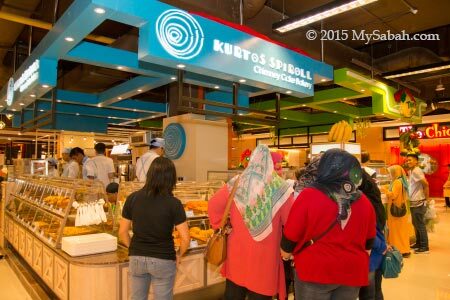 Now it is available throughout the year at the 4th outlet of Kürtös Spiroll in Malaysia (1st in East Malaysia) in Imago Mall, Kota Kinabalu. 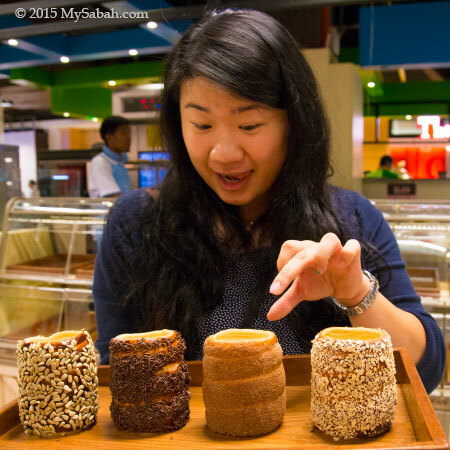 The unique shape of Chimney Cake allows you to enjoy the bread in two different tastes and textures, its outside is sweet and crispy crust but inside is fluffy & soft. I’m not a “bread” person, but I eat it with great relish. Say Hi to Chloe, my model, and also a foodie who loses control whenever she smells good food. Ok, you win. You can have them all. In first day of opening, Kurtos Spiroll already attracted many curious buyers who were keen to try something new. 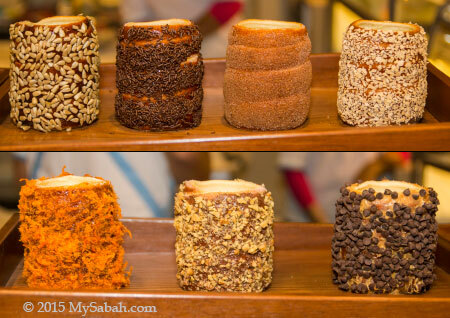 Kürtös Spiroll prepares chimney cakes on-site in traditional way, it’s baked rather than fried, and no preservative or artificial flavour is used. 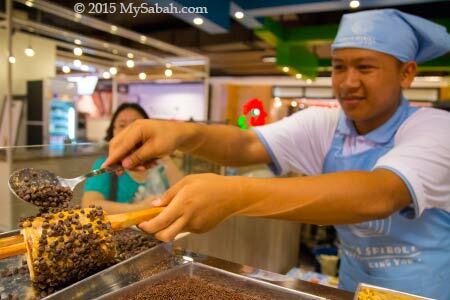 It’s best consumed within 3 hours because the caramelised surface will turn soft. Since Kürtös Kalács can’t be stored overnight, that means it’s always freshly made. 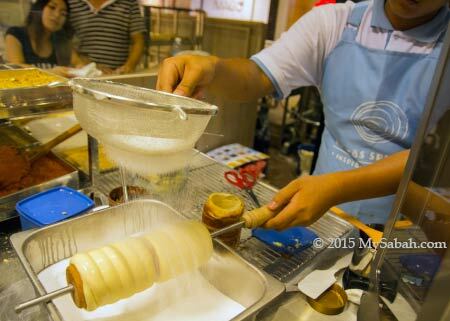 To make Chimney Cake, a special recipe dough is rolled by hand into an even strip and then wrapped like a ribbon around a wooden cooking roll. A topping of choice is then sprinkled on the steaming hot Kürtös Kalács. The dough is then caramelised and baked to perfection in a purpose built oven. Pic: Oh yea, more chocolate chips please. It is quite enjoyable to see our order is individually hand-made, which takes only 3 to 5 minutes. FYI, Kürtös Spiroll serves No Pork. Adam looks high eating Kürtös Kalács. Did they put Marijuana in your pastry? Just joking bro. Frankly these cakes can be addictive. 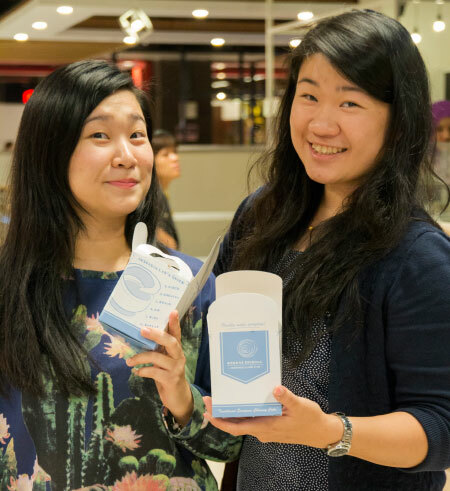 From Left: Chloe, Charlotte and Mei Tzeu. Which one you want? I mean the Kürtös Kalács LOL. 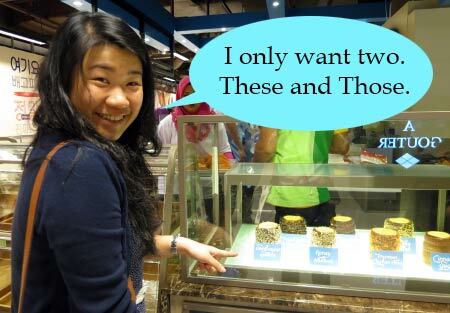 Pic: We all love Nutella Walnut flavour, which is the Best Selling one. 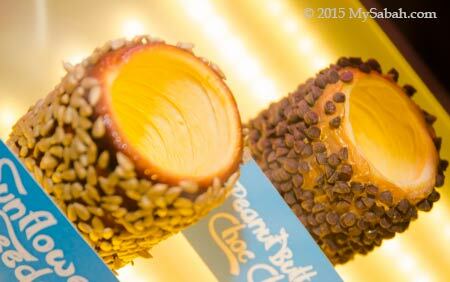 If you are not sure which flavour to try, go for this one. 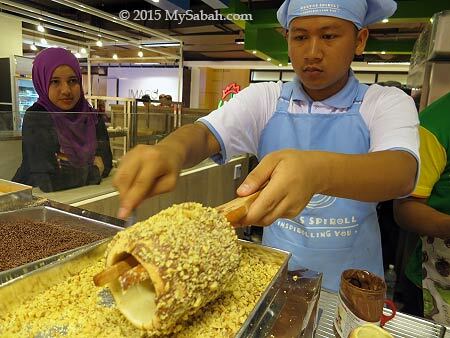 This Kürtös Kalács topped with sweet chocolate cream sauce and walnut crumbs really “inspiroll” your taste buds. 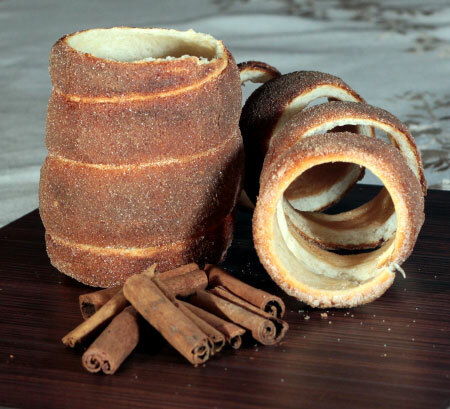 Pic: Another Best Selling Chimney Cake is Cinnamon Sugar flavour. 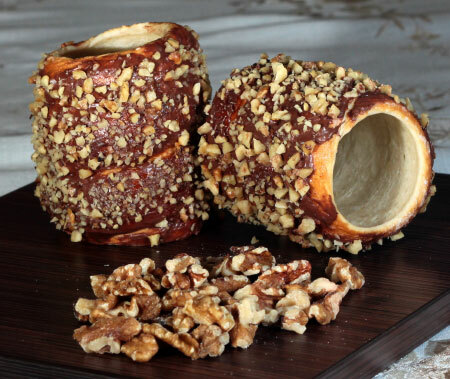 Pic: you can order Kürtös Kalács as takeaways and enjoy it with a cup of hot coffee at home. 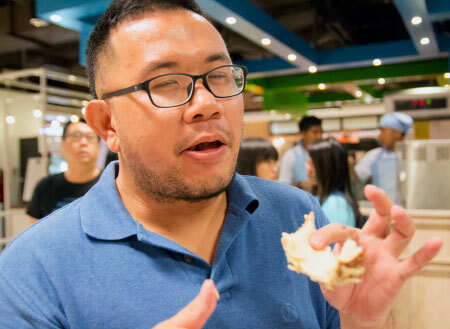 Ernie just wanted to show us the right way to eat Kurtos Kalacs. 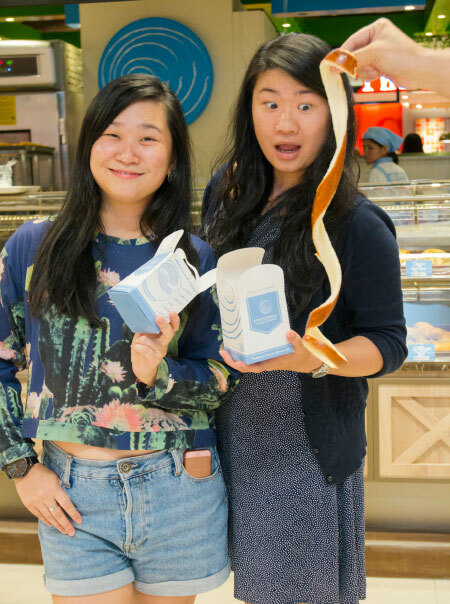 You start with a pinch to unravel the pastry, and break it into bite size. 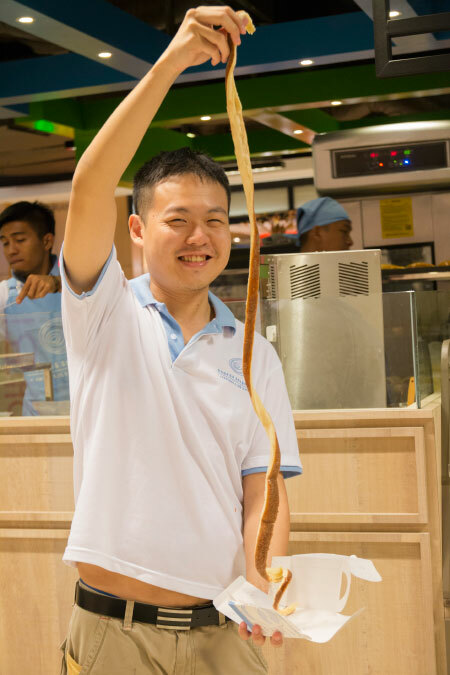 Note the peel is almost a metre long, it’s like a “roti tarik” (pull bread). I ate one already half full. 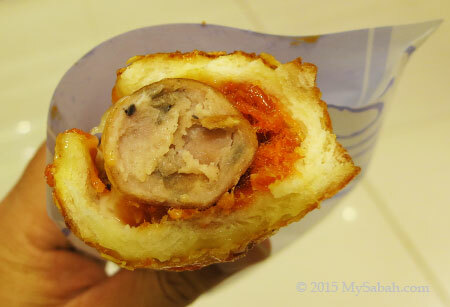 The Spiroll Dog of Kürtös Spiroll (with chicken sausage in it) is also highly recommended if you prefer something savoury. Guys will like its creamy and meaty taste. 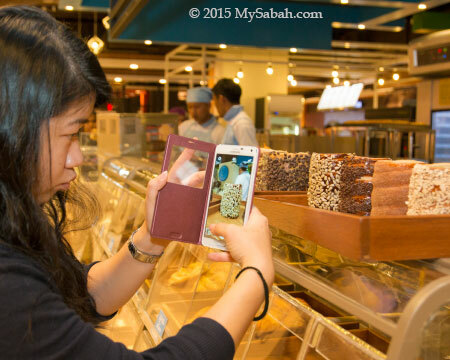 Pic: Taking photo so she can lick it as lunch next day. 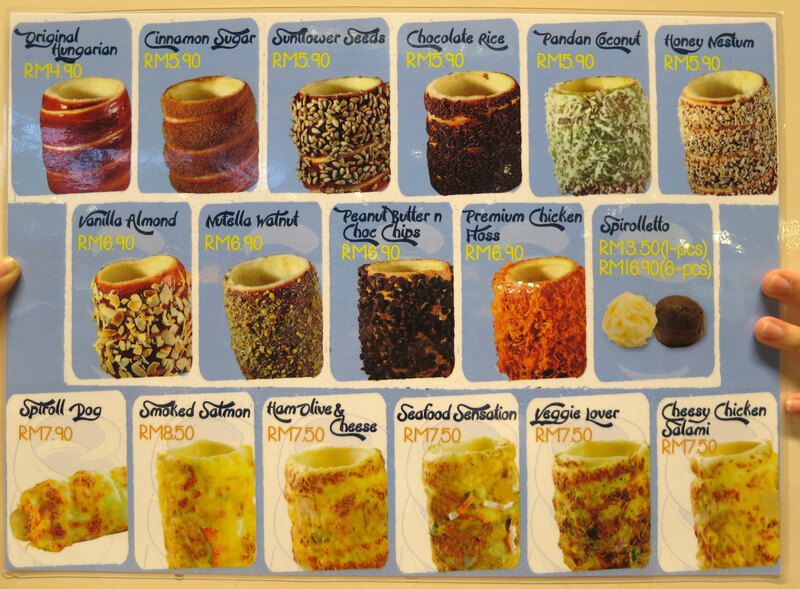 Pic: the menu of Kürtös Spiroll (can click to zoom in. Prices as of April 2015). Most sweet series (first two rows) are available. 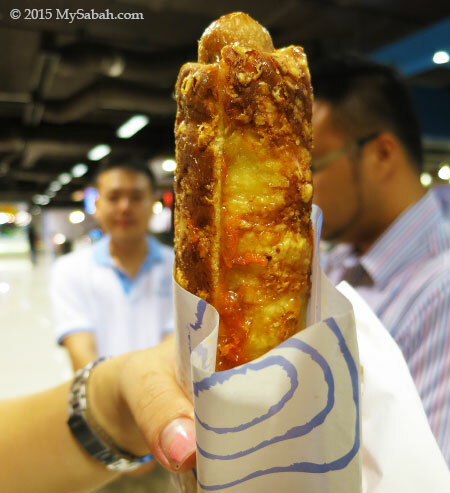 For savoury series, only Spiroll Dog is available now, the rest are coming soon. 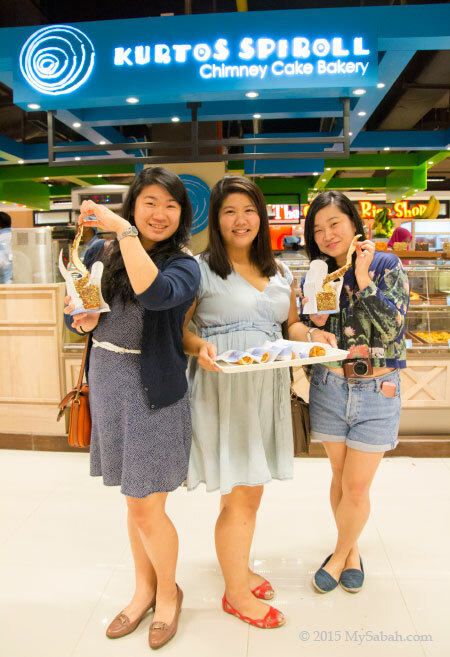 For a taste of this traditional Hungarian-Romanian treat, you can visit Kürtös Spiroll at B-49 (B Floor), Imago Mall in KK Times Square Phase 2, Kota Kinabalu City. They open from 10am to 10pm daily. 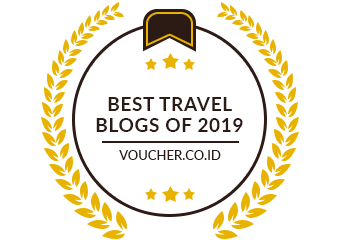 You may follow their Facebook for future promotion.